3. Separate dyed filters when dry. Fold 1 in half, and snip into fluted part every few inches. Trim snips into rounded petals. Continue to trim all filters this way, varying the type of petal shape: some rounded, some angular. Unfold. Cut green filters into leaf shapes, making sure they are large enough to be seen once fastened to the bottoms of the flowers. 4. If desired, layer several flower-petal filters on top of each other to create a more lush and full flower. Use the glue-gun to attach them. 5. Glue cups to centers of filter flowers. Glue green leaves to underside of filters. 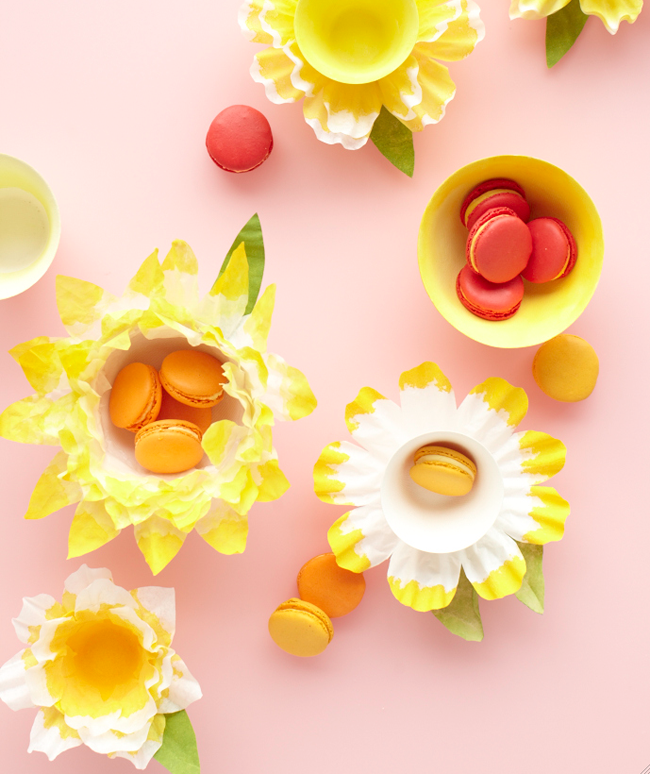 In the photos above, several examples show layers of the flower petal filters have been glued to the insides of the paper bowls to create a varied effect once a group of them are assembled on a table. 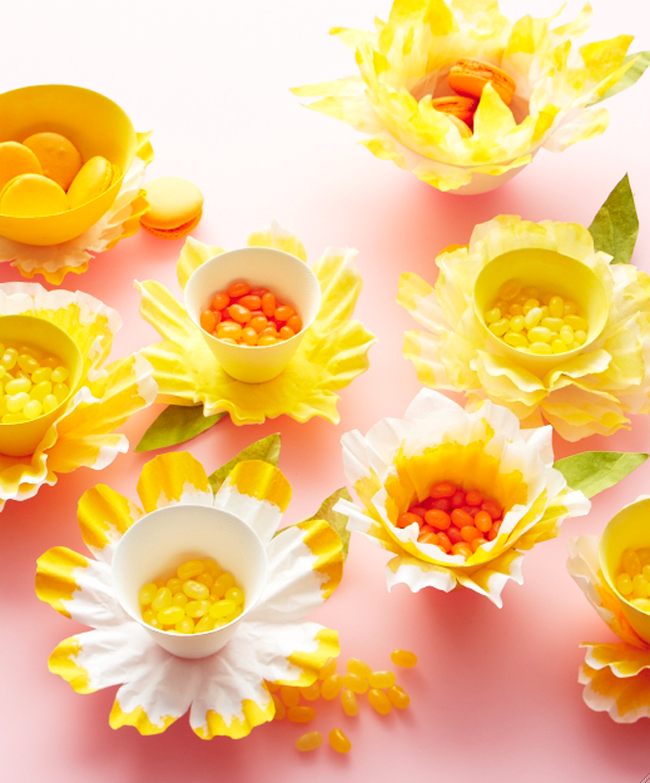 Fan out the layered petals and paint the centers a deeper shade of yellow. Click here for a variation on the same project: coffee-filter water lilies! These are SO pretty - I love the one that resembles a daffodil. The possibilities are endless in deciding how to decorate these. I can even see them made into pointsettias for the holidays. Think I'll make a supply of these for my appetizer table for Easter. Thank you for such a nice blog with a really nice project. Poinsettias for a holiday table! What a great idea! Glad you enjoyed the post! 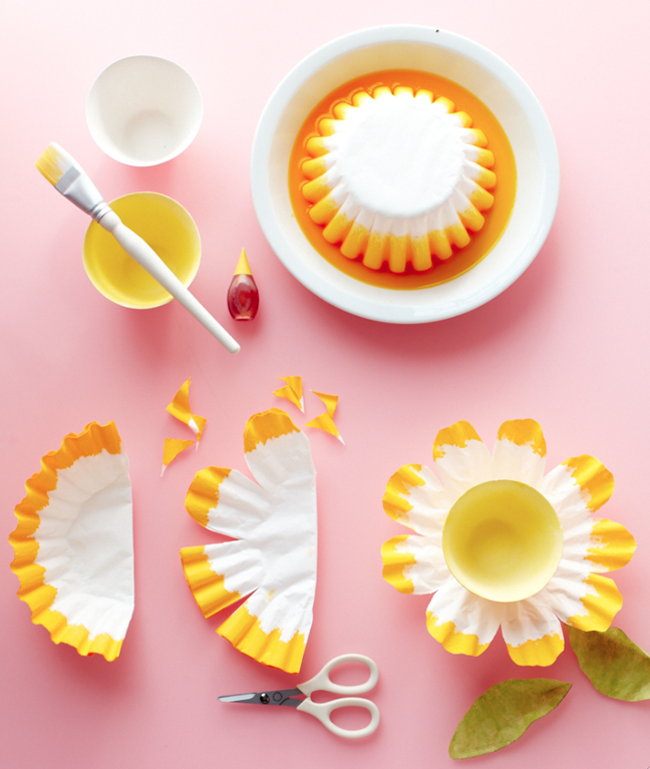 Love these coffee filter flower bowls! Could you please tell me how many ounces the cups are, 4oz, 6oz??? Great question! The paper cups and bowls were ordered from a place called branchhome.com. I put the direct link to the paper cups in the body of the post under the Materials heading. There are many different sizes and shapes on offer. The ones in the photos were 4 oz.